When I lived in Colorado, I had a hiking and camping buddy who created gourmet meals for us to eat after a long day’s hike. He wanted us to start a tour guide business. We would take tourists on a tour of the San Juan Mountains (part of the Rocky Mountains in southwestern Colorado) and show them all the interesting sites. He wanted to set us apart from all the other tour guides in the area by providing the tourists with a custom shot video of their adventures and a gourmet meal. He was a great cook and had some pretty awesome ideas for different meals to prepare. Among his creations were an excellent potato salad, various cold sandwiches, and garden-fresh salsa served with tortilla chips. The tour guide business never really took off, but out of it came one of my favorite vegetables recipes — his garden-fresh salsa. I love to eat it with tortilla chips, on top of toasted garlic bread and in quick nachos. It’s also great on turkey sandwiches; I like to spread it between turkey slices. This salsa should keep for about 4 to 5 days (although its so delicious I really doubt you’ll have to worry about it lasting that long). 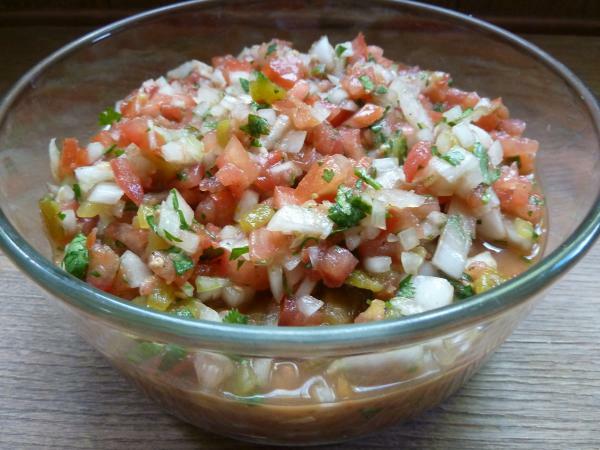 In Mexico this salsa is also known as “Pico De Gallo”. Feel free to experiment with any vegetables you like. Use this recipe as a base and add diced bell peppers, cucumbers, celery, or any others you like. Add finely diced jalapeno and/or habanero peppers to make it spicy. Please leave me a comment on what variations you've tried. Add onions, tomatoes, jalapeno, cilantro and green chilies to a large bowl. In a separate small bowl, mash the roasted garlic with a fork, then add the lime juice, vinegar, salt and pepper. Whisk this dressing while slowly pouring in the olive oil. Dump the dressing onto the bowl of vegetables and mix until everything is well combined. Pour the salsa mixture into an airtight container and set in the refrigerator overnight. Every now and then, stir it a bit since the juices tend to settle in the bottom of the container. Instead of the same old mayonnaise on a turkey sandwich, I love to spread hummus on the bread instead. l also use it as a dip with crackers, chips and vegetables. This time I used baked pita triangles. Hummus should keep for about a week in an airtight container in the refrigerator. This recipe calls for 1/4 tsp of cayenne pepper, but feel free to add more if you like your hummus really spicy. I also made this batch of hummus chunkier than usual, and I think it worked out great, but I’m still not sure if I prefer it this way or creamy smooth. Cook garbanzo beans in about 5 cups of water for about 45 minutes, or until tender. Add to a food processor, along with tahini, lime juice, garlic, olive oil, cumin, cayenne pepper, black pepper and salt. Cut pita bread into 8 triangles, open triangles up and cut the two halves — you should now have 16 triangles. Rub roasted garlic over each triangle, then brush on a bit of olive oil. Sprinkle pepper and salt on each triangle and toast in a 375 degree oven for 5 to 10 minutes until golden brown and crisp. Empty the food processor into a small serving bowl. Sprinkle a bit of extra virgin olive oil on top. If you like, garnish with paprika and/or cumin and add parsley to the center of the dish. This is a classic Peruvian dish and one you’ll find in many restaurants in Lima. For me, it’s the turmeric that makes the dish so special. The habanero gives it a slight kick, although in Peru you’d use aji amarillo instead. Many people like to eat it as a dip for crackers and/or toasted French bread, but I prefer to serve it with rice. Start by breaking the buns into small chunks. Soak the chunks in a bowl with the milk. To make a broth, boil the chicken in about 3 cups of water for 15 minutes. Remove the chicken and set apart on a plate. Into a small container, pour the broth. Break the breasts apart with a fork or your fingers until you have small strips of shredded chicken, no more than an inch long. In the same pot you cooked the chicken, saute onions along with garlic in a drizzle of oil; add the chicken bouillon, pepper, habanero or aji amarillo, and turmeric. When the onions and garlic are sauteed and translucent, add about 1/4 cup of the broth. Add the shredded chicken and mix well. Cook 2 or 3 minutes. Mash the bread and then add it to the pot; cook for about 5 minutes. If the cream gets too thick add more of the broth. Add the Parmesan cheese and mix well. Turn off the heat and remove from the stove. When serving with rice, I like to add a side of green beans or spinach fritters, but any kind of vegetable side will work. Torrejas are a very Peruvian dish. You can throw in just about any vegetable you have in your fridge, as long as you include a larger proportion of spinach. In fact, spinach here is not really optional; it helps hold the torreja together while frying, and later while eating. In this particular recipe I used lettuce, parsley, onions and tomatoes because that’s what I had in the refrigerator at the time. I love to just eat these with my hands; they’re so crunchy and full of flavor. They can also be used as sides to most of the dishes in this blog. Steam the spinach for about 5 minutes. Finely chop all the vegetables, including the steamed spinach, and place in a bowl. In a separate bowl mix the water, flour and eggs; use a fork to blend well. Add the flour-egg-water mixture to the chopped vegetables and mix well. Use a large serving spoon to scoop a dollop of the mix onto a hot frying pan that was sprayed with nonstick oil. Fry, pancake-style. When the bottom has golden-brown spots, turn and fry on the other side. The falafels pictured above are the first ones I’ve made on my own. Many years ago I watched my late friend Bob make them. Actually, he taught me many cooking basics, and he was also quite a character, so someday I’ll tell you more about him. Even though I used many spices, these falafels were not all that spicy, just full of wonderful flavor. Mom liked them so much, that she asked me to make them as often as possible. Half were fried and the other half baked (the greener ones you see above were baked and they tasted great, but were not as crispy as the fried ones). I found that frying them was difficult. At first my oil was too hot and the outside would crisp too quickly, leaving the center raw. Perhaps in the future I’ll bake them for a bit first, then finish them by frying. There are so many ways you can use falafels. Put them in salads, falafel-humus sandwiches or just eat them as snacks. This is my first vegetarian recipe on the blog, and if you’re vegan you can skip the breadcrumbs (or use vegan-friendly bread). In a food processor, chop the garbanzo beans until you get a crumbled mixture with pieces about the size of sesame seeds. Move this mixture to a bowl. In the food processor place the parsley, cilantro, jalapeño pepper, onions, garlic and 1 cup of the crumbled garbanzo beans. Chop until well combined. Spoon the blended mixture into the bowl with crumbled garbanzo beans along with the flour, cumin, crushed coriander seeds, baking soda, and about 1 tbs of salt. If you chose to use cayenne pepper add it at this time too. Finally add some black pepper to taste. Combine everything thoroughly with a spoon. Squeeze a small amount of the mixture in your hand. If it falls apart, add a few drops of water. Form the mixture into 25 to 30 balls. If you’ll be baking, place them on a baking tray covered with olive oil. To fry: In a deep frying pan, on medium heat, add enough oil to cover the falafels. When the oil is hot, fry them 3 to 5 minutes or until golden brown. Remove and drain on paper towels. To bake: preheat the oven to 350 degrees. Place the falafels on the center rack of your oven and bake for 25 to 30 minutes or until golden brown, turning the falafels over halfway through.